Grade : Moderate to Adventurous. Highest elevation : 5,545 m.
Trekking up to the Base Camp of the highest mountain in the world. Spectacular view of the mountain ranges such as Mount Everest, Mount Ama Dablam, Mount Thamserku, Mount Makalu, Mount Lhotse and many more. Exploring the Sagarmatha National Park, UNESCO world heritage site. Khumbu ice fall and glacier along the way to the Everest Base Camp. Exploring the oldest monastery of the Everest region, Tengboche Monastery. Trekking up to the Everest Kala Patthar. 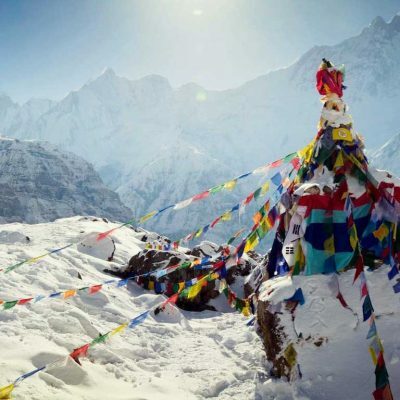 15 days Everest base camp Trek is the best itinerary to reach the Everest base camp and Kalapther. 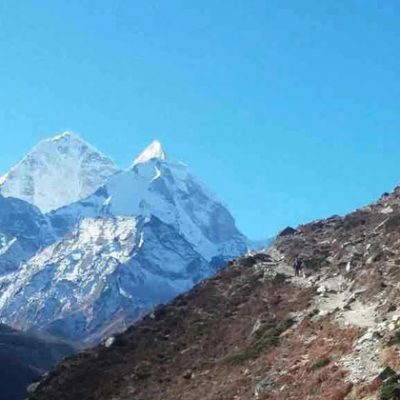 The 15 days Everest Base camp trekking itinerary is suitable for any types of trekkers who has good level of physical fitness and the itinerary has been customized for First time trekkers which take you to base camp of Tallest peak Mt Everest. Trekking to the Everest Base Camp has become the aim of many enthusiastic trekkers all around the world. 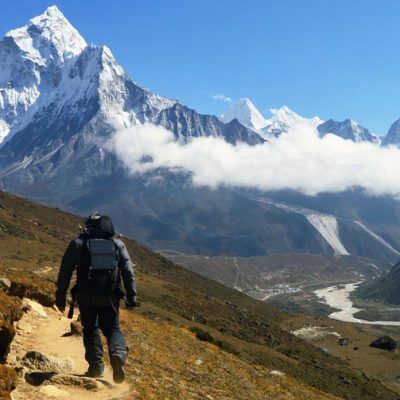 One of the most challenging treks of Nepal, Everest Base Trek will take you to the footsteps of the first ones who climbed the Mount Everest: Tenzing Norgay Sherpa, and Edmund Hillary. 15 Days EBC Trekking to the Base Camp of the world’s highest peak, Mount Everest, is an achievement in itself. The scenic view of the Everest Region and the magnificent view of the mountains which are above 7000 meters is eye-catching and rewarding. The diverse Sherpa community, the local people, their way of living, and their hospitality are amazing. This tour will give you chances to explore the tradition and culture at different villages of the Everest region. Moreover, the local Buddhist Monasteries of the Everest region significantly make your trip incredible. You will visit beautiful monasteries like Dingboche and Tengboche monastery. Tengboche is the largest monastery of the Everest region. 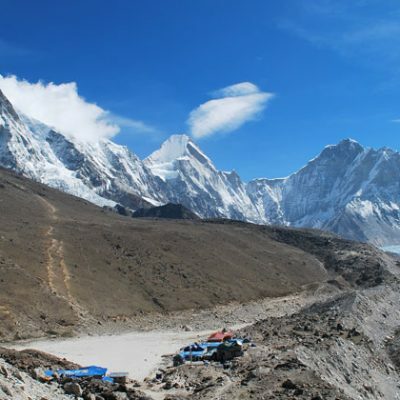 One of the major attractions of the 15 days Everest Base Camp trek is the Sagarmatha National Park. It is one of the UNESCO world heritage sites. The park homes a wide diversity of wild flora and fauna. Along with these, the dramatic mountains, glaciers, waterfalls, icefalls en route are very pleasing. Your trekking journey to the Everest Kala Patthar will give you with a lot of new experiences to cherish for a lifetime. Your incredible journey to EBC begins with a short and scenic flight from Kathmandu to Lukla. From Lukla, you will trek to Phakding, Namche Bazaar, Tyangboche, Dingboche, Lobuche, Gorakhshep, and finally to the Everest Base Camp. 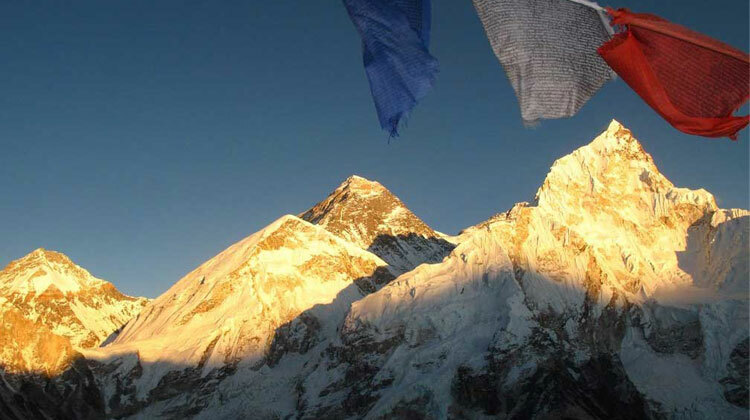 After visiting the base camp, you’ll also hike to Kalapathar, the best viewpoint of the Everest. On your way back, you’ll trek back to Phiriche, Namche, and to Lukla from where you’ll fly back to Kathmandu. We have designed the 15 days Everest Base Camp trek considering experienced as well as a beginner trekker. We have two acclimatization days at Namche and in Dingboche. This will help you to cope with the thin air and changing atmosphere. Altitude sickness is one of the difficulties when trekking to the height of 5643 meters at Kala Patthar. It is because the amount of oxygen at a higher altitude is comparatively low which results in difficulty in breathing. Unlike Annapurna Base Camp, you will not find tea houses and lodges for food and accommodation in the Everest Base Camp. You have to return back to Ghorekshep for proper food and overnight stay. For an exciting 15 days trek, join Adventure Great Himalaya. We intend to make your 15 days trek to the Everest Base Camp less challenging and more comfortable. 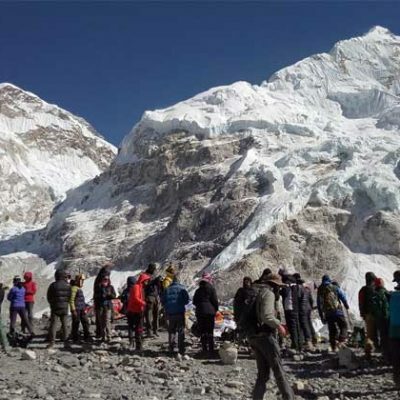 Get ready for a memorable 15 days Everest Base Camp trek with us. Day 05: Trek to Tyamgboche, 3,800m – 05 hrs. Day 06: Trek to Dingboch 4,200 m – 05 hrs. Day 08: Trek to Lobuche 4,920m – 05 hrs. Day 09: Trek to Gorakhshep(5,170m) Lunch then trek to Everest base camp (5,356 m) back to Goraksheph- 5,170 m– 08 hrs. Day 10: Hike to Kalapather (5,545 m) Everest Sunrise view then Trek back to Phiriche -4,240m, 06 hrs. Day 11: Trek back to Namche Bazzar 3,450 m – 06 hours. Day 13: Morning fly back to Kathmandu afternoon free at leisure. Day 14: Free Day-In case flight cancels. it happen a lot even high season. Trekking Permit: Necessary All Trekking Permit and company paperwork. Domestic flight Ticket: (KTM-LUK-KTM) Limit weight is 16 kg per person. Everest Trekking map,Walking Poles if needed. Trek to Tyamgboche, 3,800m – 05 hrs. Trek to Dingboch 4,200 m – 05 hrs. Trek to Lobuche 4,920m – 05 hrs. Trek to Gorakhshep(5,170m) Lunch then trek to Everest base camp (5,356 m) back to Goraksheph- 5,170 m– 08 hrs. Hike to Kalapather (5,545 m) Everest Sunrise view then Trek back to Phiriche -4,240m, 06 hrs. Trek back to Namche Bazzar 3,450 m – 06 hours. Morning fly back to Kathmandu afternoon free at leisure. Free Day-In case flight cancels. it hapend alot even high season. Arrival in Kathmandu (1,396 m.) Upon your arrival, proceed to the outside of airport terminal, our representative will wait for you to take you to the hotel which taking around 20 minutes. Please look for your name which will be shown on signage. Overnight at hotel in Kathmandu. Take morning flight from Kathmandu to Lukla (2,830 m.) and trek to Phakding (2,640 m., 4-hour trek). Today we will take an amazing flight from Kathmandu to Lukla (2,827 m.) in the morning parallel to the huge Himalayan adjacent to Nepal and China. After 40 minutes, we will be landed in a runway and our caretaker will help us carry our belongings. Then we will walk down to the Dudh Kosi River, where we connect with the main path to Namche Bazaar. After moving all the way through the small area of Ghat (2550m), we will soon arrive at our tea house at Phakding. Trek from Phakding to Namche Bazaar (3,440 m., 6-hour trek) Today, we start from Phakding and walk across the river to trek all the way through the area of rhododendron, blue pine forest and more which is really superb experience especially during the spring. We go crossways to the Dudh Kosi at Benkar and take pleasure from the scenes of snow-topped mountains Kusum Kanguru (6,369 m.), Thamserku (6,623 m.) and so on. The way then becomes fairly difficult and includes a perpendicular climb to Namche Bazaar. You will now walk through upstream on flat land, on the bank, to the fusion point of the Dudh Koshi and Bhote Koshi rivers. After crossing one of the suspension bridges above the river, we will ascend to Namche Bazaar. We get the most amazing vivid opportunities of gigantic peaks -Everest, Lhotse, Nuptse, Ama Dablam, Taweche is visible. Overnight at hotel in Namche Bazaar. Rest at Namche Bazaar. Today we will explore Namche Bazaar appropriate adaptation with the environment at the height. Namche is a prosperous village situated in a large protected hollow. And the amazing scene visible from here includes superb panorama of the Khumbu peaks and great views of Everest. Then, after having our breakfast, we also walk towards Thami (3,810 m.) over the amazing Bhote Khola River Valley or visit the national park headquarters to look at the strange displays of Sherpa culture and way of life. Trek from Namche Bazzar to Tengboche (3,800 m., 5-hour trek) We will today descend down through the Khumjung community and move to the major path to Everest at Shanasa. We will walk further to Trashinga and then move down to go across the Dudh Koshi at Phunkitenga (3,250 m.). In the daytime, it is a wide and vertical ascend through fir, black juniper, pine, rhododendron forest and reach Tengboche Monastery. Here we can see gigantic peaks AmaDablam, Kantega, Mount Everest etc. We stay at hotel in Tengboche tonight. We will walk slightly down through the forest of birch, juniper, fir and rhododendron at Debuche. Here we only steady way up but due to the elevation we have to speed ourselves increasingly all the way through the day. After passing the Imja Khola, the trail heads to Pangboche where we can see the beautiful mountain of Ama Dablam. Then our route is to climb all the way through unwrapped alpine hillsides prior to another crossing of the Imja Khola and reach Dingboche. Today you will have free for acclimation day. You will hike up to Chukung and back to hotel. Trek from Dingboche to Lobuche (4,920 m., 5-hour trek). 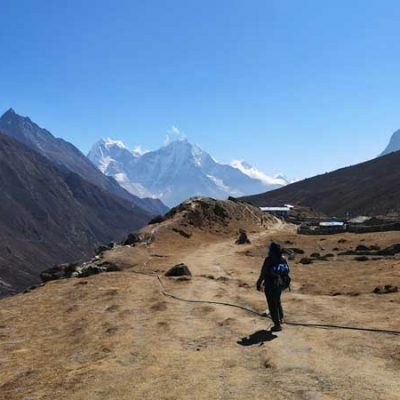 Today, we go away Pheriche and the trail goes up to the drain of the Khumbu. Then after an hour, the path mounts up to the Khumbu Glacier. Almost half of the climb to the moraine is Dughla. Moving ahead from Dughla the trail keeps on ascending steeply to the crest of the moraine. The path now moves on flat level on the west part of the moraine prior to arriving at Lobuche. Trek from Lobuche to Gorak Shep (5,170 m.) continue to Everest Base Camp and back to Gork Shep (5,356 m., 8-hour trek) We will trek towards Gorakshep today. From this place, we will walk up to Everest Base Camp, then return back to Gorakshep for staying overnight since we cannot find lodges at Everest Base Camp . Hike to Kalapathar (5,545 m.) and continue trekking to Pheriche (4,240 m. 5-hour trek). Early morning, hike to the top of Kalapathar at 5,545 meters, this will be the highest spot of the adventure, offering incredible views of mountains with Mt. Everest at closest. After a great moment, we return to Gorakshep for breakfast and continue trek to Thugla, and downhill to Pheriche on windy valley for overnight stop. Trek from Pheriche to Namche Bazzar (3,450 m., 6-hour trek). Return journey much easier as the walk drops heights every few hours, walk downhill with few short ups to Pangboche and then to a bridge with two hours climb to Tengboche. Stop for lunch in Tengboche, then continue to Namche Bazzar. Over night at Namche Bazaar. Trek from Namche Bazaar to Lukla (2,840 m., 6-hour trek). Morning walk leads back to Phakding and from here back to Lukla with last and final climb of this fabulous adventure, on reaching Lukla, celebrate last night dinner with fellow trekkers and staff. We will wake up early in the morning and get ready for the entrance of our plane for returning back to Kathmandu. Then, we will transfer back to our hotel. Remaining day to explore in Kathmandu, overnight at hotel in Kathmandu. Today we have free day. We keep this day as a spare day in case flight from Lukla to Kathmandu is cancelled. Our representative will transfer you to Kathmandu International Airport for your way back to your country. Welcome or Farewell Dinner in Nepalese Cultural Restaurant. How hard is this Trek? If you can walk 5 miles a day and are in good aerobic shape (with a doctor’s approval), you can do fine and make it. The actual trekking is on mostly level ground with a few sections of steep hillsides – up and down. You should not carry more than a light day pack with a jacket, water and snacks. However, it is the altitude that creates the main issues. That said, the better shape you are in, the more you will enjoy the overall experience. What training should I do before go this trek? There’s no specific training needed if you are reasonably fit. If you are completely sedentary, then yes some cardiovascular training would be recommended. Stair climbing or hill walking will get most people ready. Remember you’ll be walking up and down rough paths for 8-12 days. You’ll be at altitude too which will make things much harder. Having a good level of fitness will help you enjoy your trek more and always remember, it’s not a race! What is the best time for this trek? October, November and December is Nepal’s peak season and it is the best time to go trekking. February, March and April is the end of the dry season and it is the second best time of the year to go trekking. November, December, January and February, the sky is clear, but it can be very cold in the mountain. May to June is Nepal’s hot season and it can get very warm indeed. June to September is the monsoon season and the least popular time to go trekking in Nepal. What Kinds of equipment Do i Need for this Trek?? What is the Booking Term and Condition? For the booking and term condition visit the below link.